After years of debate, Cal State Long Beach President Jane Close Conoley has decided to retire Prospector Pete, the campus’ controversial mascot. The official announcement Thursday includes a host of changes, including moving a statue of Prospector Pete that students have walked by for decades in the quad of the Liberal Arts Building 5 to a new Alumni Center that is set to break ground in spring 2019. But the name “the 49er’s” isn’t so easy to shed—they’ve got the 49er Shops, the 49er Foundation and the Daily 49er all using the moniker—so Conoley said the university will pivot to using “the 1949er’s” instead, in reference to the year campus was founded. “That was a brilliant and a blinding flash of the obvious the other day, when we realized that the controversy is really about 1849, and we were never the ‘1849ers,’ we were always the ‘1949ers’ and so we’ll start inserting that 19 in there,” Conoley said. After the student government passed a resolution in March to ask the university to disassociate with the Gold Rush era, a committee of students, faculty, alumni and athletics staff met over late spring and early summer. Together, they agreed mascot Prospector Pete needed to be retired and the statue moved. 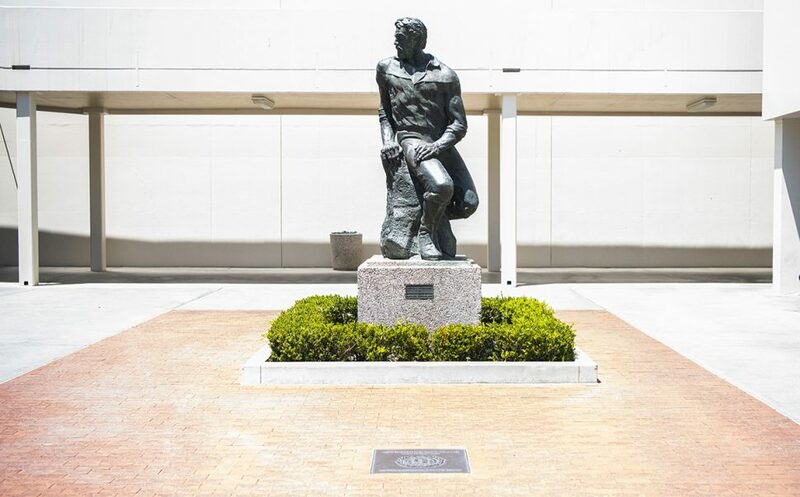 “Pete the Prospector” sits in a plaza in between the Liberal Arts buildings and the Quad on the upper campus of CSULB on August 7, 2018. Photo by Thomas R Cordova. Beloved by some and reviled by others, Prospector Pete has been a contentious issue since at least the 70s, when people started pointing out the realities of Gold Rush-era prospectors, including mass murders of Native Americans in pursuit of riches. The university is also built on top of the village of Puvungna. The Tongva tribe once lived there before the prospectors of the Gold Rush and settlers pushed them to near extinction. Conoley said Peterson would often talk about “striking gold in education” when starting LBSU and the “rush” for education in Long Beach when the university was founded in 1949. While Conoley wants to honor the university’s past, she wants to move it forward too, she said. To do that, they launched a new web page that details the history of the mascot and the reasoning for changing it. The process to find a new mascot will be a thoughtful one, Conoley said, and will be part of the bigger campus revisioning project called “Beach 2030,” a two-day event in November that will gather input online and in person from students, faculty, alumni and the public on what LBSU’s goals should be over the next decade. One of the questions will ask what the public wants in terms of a new mascot. Using that information, student government leaders can choose to lead a referendum vote on what the new mascot could be in the spring. “If there’s a statue or mascot that disempowers some people in our community, its important to address it as agents of change in this world,” said vice president of Associated Students Inc., Leen Almahdi. Athletics have also been moving away from the Prospector Pete mascot and 49er name for years, opting instead for being called “The Beach” and “Dirtbags” for baseball.